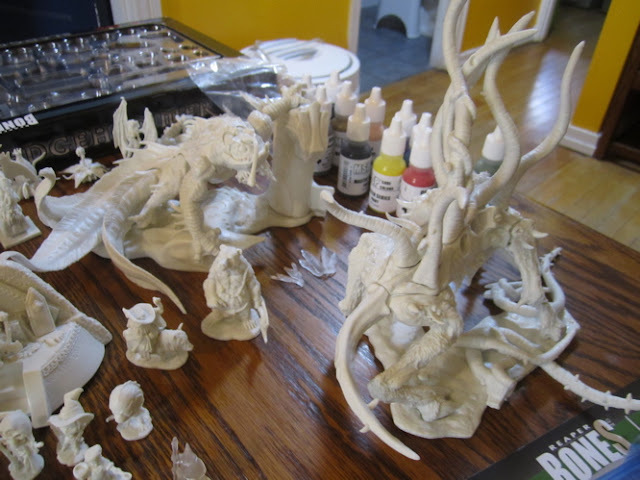 My penultimate entry for the Lead Adventure Forum’s Lead Painter’s League. Tomorrow the entries for the final round should go up. 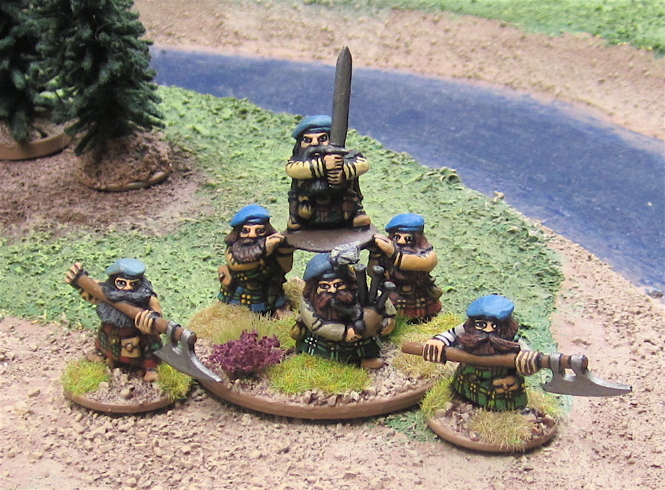 A batch of Dwarven Highlanders from Black Hat Miniatures. These are all being painted and organized into a warband for Dragon Rampant. The new figures from Black Hat will not form a unit on their own – well, some of them will – the Chieftain and a couple attendants will form a unit. The rest of them will be distributed between all the other units of Dwarf Highlanders. The Clan Chieftain and his guard. I’m not sure if they should be a reduced model unit of Bellicose Foot or count them as Elite Foot…? The ordinary units of Highlanders I figured would be Bellicose Foot. I’d considered giving them the “Terrifically Shiny Armour” upgrade, just to make them a bit tougher… But now that I have SIX units of them, it makes sense just to call them plain Bellicose Foot @ 4 points each. Here are all the Dwarven Highlanders I have painted up so far organized into units for Dragon Rampant: three units of Bellicose Foot plus the Clan Chieftain – whatever he ends up being. I have another three to finish up (which will actually be 30+points when I’m done – more than the “standard” 24 points… but that’s how I roll…). I suppose this could currently be fielded as a 24 point unit if I called all four units Bellicose Foot with the “Terrifically Shiny Armour” upgrade (the Chieftain being a reduced model unit…). In addition to this Highland Dwarf Warband, I have a completely separate Mountain Dwarf Warband I’m working on for Dragon Rampant… and they are not always friends… The recently posted Dwarven Rangers are part of the Mountain Dwarf Warband. 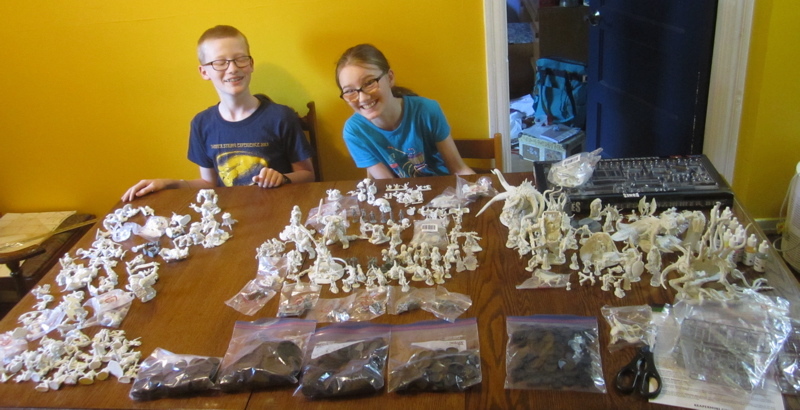 Our Reaper Bones Kickstarter rewards arrived…. It took some time to origanize all the stuff and make sure whe’d gotten all of the stuff we’d ordered. Orcs (my last entry to the LPL)? Love the Highland dwarves (as opposed to mountain dwarves of course! )That's a pretty big mound of plastic to wade through, good luck with that and the bikes! Thanks Iain! I'm in no rush to paint any of the Bones stuff (well... other than the Dark Young - as I may actually make use of that in the first Cthulhu Invictus adventure I'm planning to run... sometime this summer...?). The kids both got loads more than me - it only LOOKS Like I my pile is big because I got four HUGE models - the Frogemoth, Shubniggurath, etc. Dwarves are always good, and Highlanders are always good. The dwarf highlanders look great. Nice work! 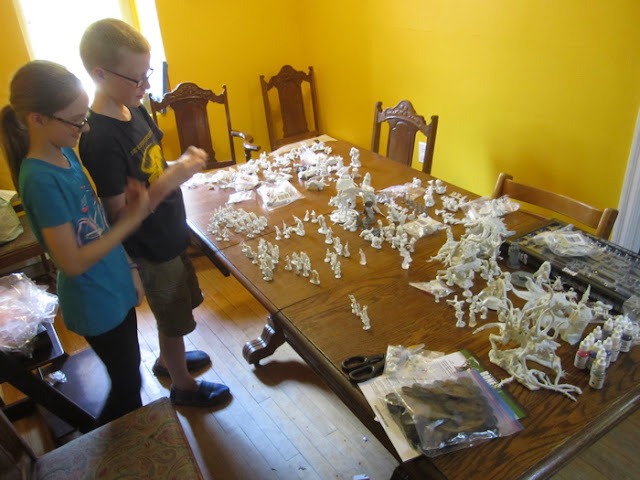 Good luck with the plastic mountain! Cheers! I am looking forward to seeing more of those painted Iron Mask Miniatures on your blog! I received my Bones 3 as well. It was left on the front step. Of course I had to have the Cthulhu stuff as well! One thing about Kick starter's, it's like having a Birthday almost every month this year! I don't back THAT much stuff on Kickstarter... Okay I have backed a few things this year so far... Dwarven Gold Fever, the Jet Bike Construction Kit, Psi-Paladins for Mutants and Death Ray Guns, Sierra Madre's Bios: Genesis, and Genius Game's Cytosis... and now Astropolis II... oh, and a couple of graphic novels!? CRAP! I guess I have backed a lot of stuff this year - but I doubt I'll be backing much more and that's probably more than I've back in all the previous years that kickstarter's been around, combined! Financial reasons stopped me getting Bones 3. Still disappointed about it, and it looks amazing. There seems to be a growing consensus on the DR Facebook group that Bellicose Foot are under powered for the cost. The fix seems to be giving them 1 more point of armour for free. Interesting. I have yet to play with these, but I'll have to keep that in mind. Thanks!